In North Phoenix, Arizona, nestled in the foothills of a picturesque mountain preserve, you’ll find the remarkable community of Norterra. Norterra is found in close proximity to abundant natural beauty and has hiking trails throughout the area so residents can experience the breathtaking views. 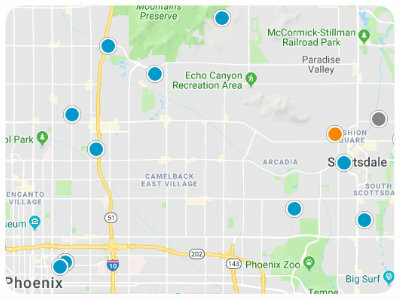 With great shopping nearby and convenient freeway access, Norterra is a wonderful place to buy a home in North Phoenix. This impressive community perfectly balances convenience and privacy with a peaceful setting adjacent to the mountains and direct access to the 101 and I-17. Sedona and Flagstaff are only a few hours away, and the glistening waters of Lake Pleasant is also easily accessible via Highway 74. Whether shopping for groceries or grabbing a coffee, residents of Norterra find all that they need at the Happy Valley Towne Center. At the northeast corner of I-17 and Happy Valley Road is another shopping center, the Shops at Norterra. The Shops at Norterra also provide excellent shopping opportunities as well as numerous dining options. The open-air center is pedestrian friendly and boasts gorgeous landscaping. In addition to the wonderful shopping options, beautiful landscapes and easily accessible highways, Norterra also has great schools. Residents of Norterra are served by the Deer Valley School District which is ranked in the top 6 of 42 school districts in the Phoenix area. Norterra is home to several remarkable communities with diverse real estate options. One such community is that of Dynamite Mountain Ranch. Dynamite Mountain Ranch has around 1,314 homes bordering the Phoenix Sonoran Preserve. With its close proximity to Lake Pleasant Regional Park, residents of Dynamite Mountain Ranch in Norterra can easily enjoy abundant recreational opportunities including fishing, boating and more. Other Norterra communities include those of Valley Vista, North Gateway-Talavera & Heritage, Sonoran Foothills and Fireside at Norterra. Fireside at Norterra is composed of a combination of condos, townhomes and single family homes with one-story and two-story options. Norterra is also home to a 16,000 square foot community center that has an indoor climbing wall, adult and children’s swimming pools, a large fitness room, basketball and tennis courts, and hiking and biking trails. If you would like to buy a home in Norterra of Phoenix, Arizona, please do not hesitate to contact us today for more information.